(b) uphold and enforce this Constitution and the law. The Police of South Sudan shall be governed by this Constitution and the law. It shall respect the will of the people, the rule of law and order, civilian authority, democracy, human rights, fundamental freedoms and execute judicial orders. shall be correctional, reformative and rehabilitative. It shall respect the will of the people, the rule of law and order, civilian authority, democracy, human rights and fundamental freedoms.Art.156(2), 2011 Constitution. Prisons authorities shall treat prisoners humanely. Any treatment that is cruel, inhuman, degrading of the dignity of prisoners or that may expose their health to danger is prohibited and punishable by law. Otherwise the Constitution does not lay down detailed rules for the use of force by law enforcement agencies. The primary legislation governing the police in Sudan is the 2009 Southern Sudan Police Service Act. The law provides that the South Sudan National Police Service (SSNPS) has the primary responsibility of ensuring the security of citizens and maintaining public order; it is also responsible for implementing the law in accordance to national and international standards. 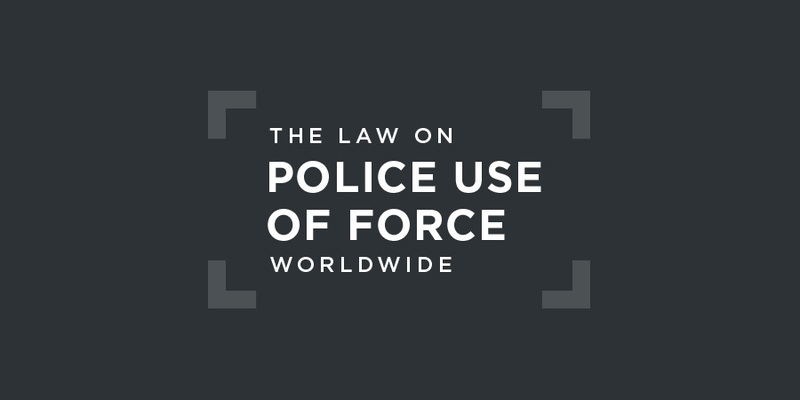 To perform the duties and responsibilities mentioned above, police personnel may use reasonable force where necessary according to the restrictions provided for by law. Although this section of the 2008 Code does not explicitly refer to the use of force, "all reasonable means necessary" presumably means that the force used must be both reasonable and necessary. Any act done by a police personnel in good faith while discharging his or her functions and duties, or in performance of his or her functions and duties under any law, regulation, order, rule or instruction of a competent authority or person authorised to issue the same by virtue of the Code of Criminal Procedure Act, 2008, or any other law in force, or any regulations issued thereunder, shall not constitute an offence. No police personnel shall be arrested for or charged with murder in connection with acts committed in the course of his or her duty, except with a written authorisation obtained from the President in the case of officers, or a written authorisation from the Minister or Inspector General in the case of non-commissioned officers and privates. Beyond the duty set out in the 2011 Constitution to treat all prisoners humanely, there are no detailed provisions on use of force against those in custodial settings in either the 2011 Constitution or the 2003 Prisons Act. (1) Police Courts shall decide on acts and omissions by any police personnel subject to the provisions of this Act, which are considered criminal acts, or contraventions of this Act or any other legislation or regulations, if committed while discharging official duties. (2) Complaints against police personnel received through a civilian complaint system, established by regulations, shall be referred to judicial courts subject to the regulations. (3) Without prejudice to the provisions of subsection (1) above, the Minister, upon the recommendation of the Inspector General, may refer any criminal case to any court if that will serve the cause of justice. investigate, on its own initiative or on a complaint made by any person or group of persons against any violation of human rights.Section 7(1)(b), 2009 Southern Sudan Human Rights Commission Act. While some accountability measures in specific individual cases were noted, including arrests and investigations in relation to the alleged killings of civilians by police in Central Equatoria and Northern Bahr el Ghazal in November 2014, in general there appeared to have been no meaningful efforts by national actors to hold perpetrators of gross violations of human rights accountable. "Human rights situation in South Sudan, Report of the United Nations High Commissioner for Human Rights", UN doc. A/HRC/28/49, 27 March 2015, §45. On 5 December 2014, senior officials of the Presidential Committee on Human Rights Abuses, established in January 2014 to investigate human rights violations and abuses committed by security agents and opposition forces, informed the UN that its report had been finalised and submitted to the President. At the same time, the Inspector General of Police of South Sudan informed the UN that investigations conducted by the National Police Service into the violence that erupted in December 2013 "had been unable to link any police officer to human rights violations". "Human rights situation in South Sudan, Report of the United Nations High Commissioner for Human Rights", UN doc. A/HRC/28/49, 27 March 2015, §46. South Sudan has not ratified the Protocol on the African Court of Human and Peoples' Rights. The majority of cases in South Sudan are undocumented making it difficult to report on the country’s national jurisprudence surrounding police or prison officer use of force.